Photos courtesy of Sean Bartlett and Bee Shaker Team. College Park, Md.—University of Maryland (UMD) Clark School of Engineering students are leveraging their know-how to help bee biologists develop a non-chemical, mechanical solution to one of the toughest problems facing honey bee populations. As part of a cross-department collaboration between the UMD Department of Entomology and the Department of Mechanical Engineering, students, researchers and faculty are joining forces to develop a device that could help greatly reduce the number of parasitic varroa mites currently infesting honey bee colonies. According to UMD Assistant Professor and honey bee expert Dennis vanEngelsdorp, varroa mites are one of the leading causes of mortality for European honey bees, and the number one issue challenging bee keepers. Varroa mites, sometimes referred to as vampire mites, are ectoparasites that feed off the blood of both adult and juvenile bees, weakening their immune system and making them susceptible to viruses and infection. Varroa mites are a particularly pesky problem for bee keepers because the parasites are becoming resistant to chemical treatments, and treatments that are effective, cannot be used when bees are producing honey for human consumption. Over the years, vanEngelsdorp, who is also a Project Director for the Bee Informed Partnership, noticed evidence that hive disturbances—such as hive relocation or transport in a vehicle—often led to a decrease of varroa mite infestation on bees in a hive. The disturbances seemed to generate enough vibration to cause the mites to fall off of their hosts. These observations made vanEngelsdorp wonder if he could create a non-chemical, mechanical solution to this problem—a hive mounted 'Bee Shaker' that could simulate these disturbance events, creating enough vibration to force mites off of their host bees without physically moving hives. At the suggestion of Bee Informed Project Manager and engineer, Karen Rennich, vanEngelsdorp contacted UMD's Department of Mechanical Engineering for help. With the assistance of the undergraduate office, the department was able to assemble a team of faculty and undergraduate students to take on the project as part of the department's 'Special Problems' class aimed at tackling "advanced problems in mechanical engineering." 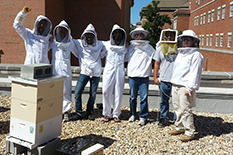 Led by Mechanical Engineering Assistant Professor Jin-Oh Hahn, the 'Bee Shaker' team included post-doctoral research fellow Chang-Sei Kim and undergraduate students Max Franz, Jake Johnson, Mark Ragland, Sean Bartlett, Pedro Pessoa and Matthew Lewis. The students formed a consultant-like team that met with vanEngelsdorp and Rennich to discuss their ideas and put together a plan for tackling the problem. Over the next nine months, the students dove into the design challenge, brainstorming ideas, and selecting and discarding components to develop the initial 'Bee Shaker' prototype. The student team applied principles of control systems engineering—the same principles that apply to things like automobile traction and cruise control systems—to develop a successful prototype 'Bee Shaker' capable of producing vibrations at variable speeds, forces and frequencies. The students, who divided the work up between hardware, software and housing, designed the shaker to be mounted to the side of a hive and be computer controlled and programed, so beekeepers and researchers could test a variety of scenarios on the hives. As part of the next phase of the project, students refined the prototype design this spring by making it smaller but more powerful, and capable of running off of a portable energy source such as a car battery. The current team, Johnson, Lewis and Pessoa, also standardized the prototype production process by designing the unit to be built out of parts that could be manufactured on a 3-D printer. Collaborative efforts like the 'Bee Shaker' project are part of an ongoing effort to create multi-disciplinary design courses for engineering students. These projects not only assist researchers attempting to solve critical issues, but create unique learning opportunities for students. "Such projects…allow students to exercise their design and analysis skills on an open-ended and realistic project, which is often difficult to squeeze into a classroom environment," said Mechanical Engineering Director of Undergraduate Studies Ken Kiger. "[Students] also get practice articulating ideas to a different audience, which is an important skill for their future profession." Based on the team’s success with its designs and fabrication process, it plans to provide vanEngelsdorp with 6 working prototypes by May 2014. vanEngelsdorp plans to test the units on colonies to determine their effectiveness on varroa mite infestation. The Bee Informed Partnership is a collaborative effort between research institutions, universities and beekeepers funded by the U.S. Department of Agriculture and the National Institute of Food and Agriculture to get information collected from beekeepers back to beekeepers quickly so they can make more informed decisions. Bottom image: Mechanical Engineering student Max Franz.